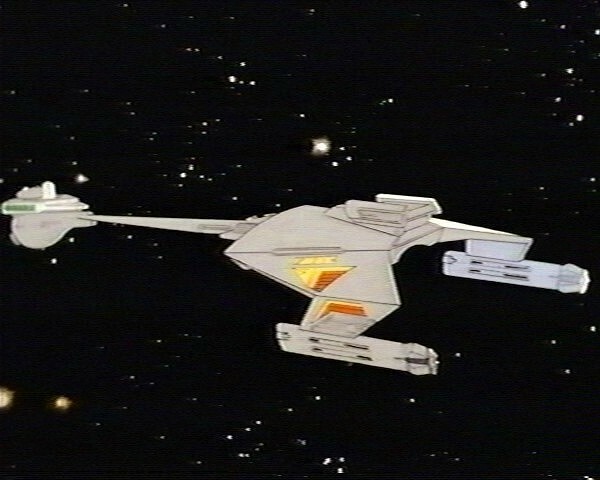 Animated STAR TREK - "The Survivor"
Patrolling near the Neutral Zone, the U.S.S. Enterprise finds a ship manned by Carter Winston, a Federation citizen who has been missing for 5 years. Winston turns out to really be a Vendorian, an alien species that can transform its shape at will. PSA epilogue for "The Survivor"
This episode featured the first appearance of Lieutenant M'Ress. M'Ress was a felinoid, with long, thick orange-tan fur and golden yellow eyes. M'Ress spoke very softly and had a cat-like purring quality to her voice, which became especially evident when she was excited. M'Ress sometimes stood watch on the bridge as relief Communications Officer. She came aboard with Arex in 2269. The author of this episode, James Schmerer, has written quite a number of other television series episodes, including those for Mannix, Hawaii Five-O, The Fall Guy and Starsky & Hutch. Interestingly, Schmerer colaborated on the script of the 8th episode of MacGyver with Douglas Brooks West and fellow STAR TREK writer Stephen Kandel. Coincidentally, that episode also featured guest actress Nana Visitor who would go on to become the regular cast member Major Kira Nerys on STAR TREK: Deep Space Nine. The late Ted Knight (pictured) provided the voice of Carter Winston. Knight later gained fame as Ted Baxter on The Mary Tyler Moore Show from 1970 to 1977. Ted Knight was a longtime friend of Filmation co-founder Lou Scheimer who hired Knight on a number of occasions. Ted Knight also narrated and provided voices on several other Filmation animated series including Aquaman, Superman, Batman, Superboy and Lassie's Rescue Rangers. The Vendorian alien seen in this episode would have been impossible to do convincingly in a live-action show. 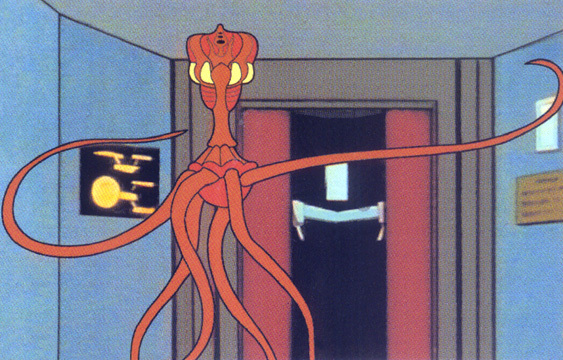 Another example of the animated STAR TREK series being able to show us interesting non-humanoid aliens. In one scene that seems a bit unbelievable, after standing in sickbay for a minute or two, Kirk notices that there's an extra biobed in the room. It's hard to imagine that McCoy, who spends most of his time in sickbay, doesn't notice it first. Also, Spock is very observant and not prone to distractions as McCoy is, so the Vulcan should also have noticed before Kirk. This episode was similar to the original series episode "The Man Trap" in which a single shape-changing intruder that had a romantic history with an Enterprise officer was loose on the ship and which takes the place of Dr. McCoy briefly. There is a page in this site devoted to the Carter Winston's Personal Starship that was seen briefly at the beginning of this episode. This episode featured the first appearance of Romulans on the Animated STAR TREK series. Romulans appeared again in "The Time Trap" and "The Practical Joker". There is a page in this site devoted to the Romulan Ships that were seen in this episode. Majel Barrett did three voices in this episode. Transporter Chief Kyle was seen in this episode, again sporting a moustache, but he had no dialogue. There was a visual error in this episode, in one scene Lieutenant Nored's insignia was on the wrong side of her uniform. Dr. McCoy's daughter, Joanna, was mentioned but not shown in this episode. The original draft of the original STAR TREK series episode "The Way to Eden" was called "Joanna" and had McCoy's daughter as one of the space hippies. The script was extensively rewritten and her character became Irina Galliulan. "The Survivor" was novelized by Alan Dean Foster in Star Trek Log Two published by Ballantine Books in September 1974. Also novelized in the book was "The Infinite Vulcan" and "The Lorelei Signal".